Superbe Cottage en Basse Banque plage près de Brooks Point, observer les baleines! Regardez les orques nagent que vous apprécierez votre café du matin sur la grande terrasse en pierre. Autre grande observation de la faune comprend phoques, des marsouins, des loutres, des aigles, le vison, le cerf. Magnifiques vues sur l'océan de toutes les fenêtres orientées au sud. 2 lits Queen, plus 2 lits jumeaux (avec matelas de mousse). Salle de bain complète avec douche / baignoire combo. Cuisine équipée: réfrigérateur, cuisinière / four, lave-vaisselle, micro-ondes, cafetière, mixeur, etc. Étapes par la porte arrière de la plage de galets. Les enfants pourront profiter de la plage peignage et explorer les bassins de marée pleins d'étoiles de mer, crabes, concombres de mer et plus encore! Les grandes pelouses sur la propriété de 2 acres idéal pour les enfants. 5 minutes en voiture Cove Resort du poète, avec un spa à service complet, des restaurants, un pub, piscine publique, aire de jeux. Louez un kayak ou en canot sur votre propre, ou réserver une tournée à travers Cove Marina de poète. Parc Régional Belle Brooks Point est à une courte promenade le long de la plage, avec une partie du restant dernier habitat du chêne de Garry Meadow dans les îles Gulf. Il offre une vue sur l'île de Vancouver à l'Ouest, les îles San Juan vers le Sud et Mt. Baker à l'Est - un rêve de photographes! S'il vous plaît noter que nous ne sommes plus en mesure d'accueillir les animaux domestiques. Top notch cabin, exactly as advertised. Clean, comfortable, well equipped. And the view is of course outstanding. There’s also a good sized garden area to run around in. The beach is on your doorstep and really is fantastic for kids and adults alike; the rock pools have more diverse sea life than any other cabin we’ve stayed at. The beach also extends to the east a long way, providing for some good walks and scrambles on the rocks. We've stayed at many gulf island/Sunshine Coast cabins over the years, but were particularly happy here. Beautiful location, breathtaking views, peaceful and private. A beautiful well equipped home at a great location. The weather was in our favour and it was warm and sunny for the duration of our stay. I imagine it would be no less spectacular in any weather though as the ocean and wildlife provide continuous entertainment. Very comfortable and well equipped cottage in an absolutely perfect location.So happy that we found this spot for our very spontaneous November family time. It was hard to leave. We are so pleased that you enjoyed your getaway! We look forward to having you back soon! Beautiful setting, lovely cottage, great views, lots of wildlife both on the water and on land. Couldn't be better! Those front windows on the water are outstanding and we could barely take our eyes off the ever changing water views. This is our second time at this cottage and we had a great time. The cottage is in an excellent location. We saw lots of wildlife. 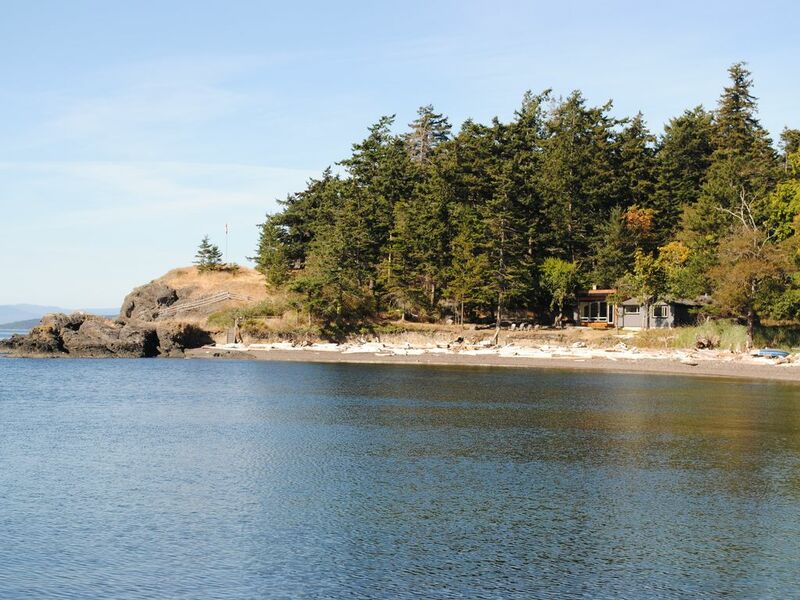 An absolute jewel of the gulf islands! A world of peace, tranquility, amazing wildlife experiences, best hikes- everything you could want! and all while staying in a lovely comfortable modern home watching the ocean and it's daily surprises. We've been entertained by seals, eagles, otters, deer etc. Owners are a delight to deal with. Only problems were that the time went by too quickly and how hard it was to leave! Regardez les orques nagent que vous avez votre café du matin sur le pont. Marchez sur la plage à Brooks Point Regional Park, un joyau de la conservation avec une vue imprenable et rares lis de chocolat. Please note: Check In time is 3:00pm; Check Out is at 11:00am Strictly no smoking.